Yes, I’m afraid it’s another fog post. This tree sits directly across the river from a large high school (my old high school as it turns out), and if you were to turn your head to the right from this perspective you would see a large municipal swimming pool. Such are the challenges of the urban nature photographer. The fog made things so much easier. This entry was posted on March 9, 2011 by Charles Ford. 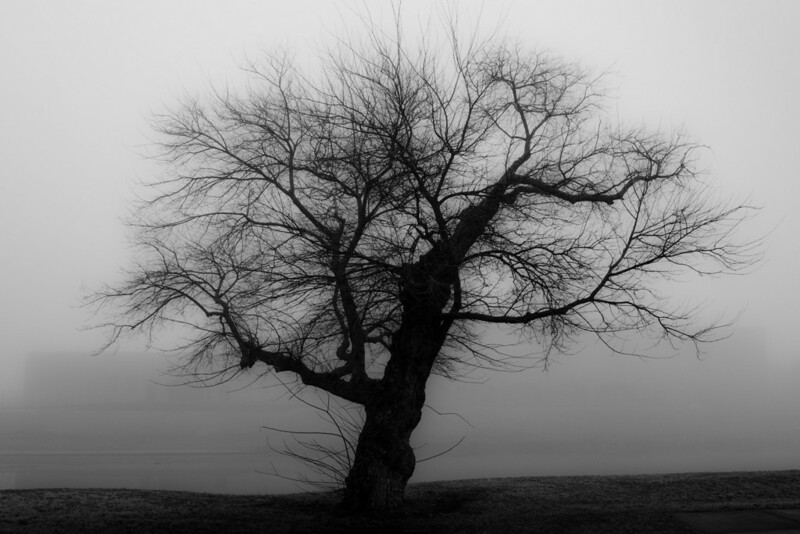 It was filed under Fog and was tagged with Fog, Photography, Tree, Wichita. The tree isolated against the stark background is stunning, Charles. You got some pretty amazing shots in the fog. Is the black and white a conversion? Thanks for the comments. Yes Ken, all the fog images are black and white conversions from the original RAW files using Lightroom. I’m sure I have a lot more to learn about that process, I’d only tried it on limited occasions prior to this. Very impressive work. The fog shots are excellent. This one in particular is classic. It reminds me of William Fox Talbot’s An Oak Tree in Winter. I found your photo-blog by way of the blogroll on http://artismysanity.wordpress.com . I’ve added your site to my blogroll too. Keep doing your photography. I wanted to say thank you for taking the time to post your kind comment, it is appreciated. Good info. Lucky me I found your site bby chance (stumbleupon).